But the underlying picture is much worse for Republicans than this, as Gary Kamiya observes. On the one hand, the Pew Survey shows that Democrats and Independents are becoming pretty similar in the views to people elsewhere in the developed world (such as Europeans) – liberal on social issues, moderately social-democratic in social policy, preferring peace to war and so on. Not surprisingly, this translates to a strongly negative view of the Republican party, just as it does everywhere else in the world. On the other hand, Republican support is contracting to a base of about 25 per cent of the population whose views are getting more extreme, not merely because moderate conservatives are peeling off to become Independents, but also because of the party’s success in constructing a parallel universe of news sources, thinktanks, blogs, pseudo-scientists and so on, which has led to the core becoming more tightly committed to an extremist ideology. There’s plenty to support this account outside the Pew survey. This Gallup poll shows that a majority of Democrats and a large plurality of Independents think that the US is spending too much on the military – hardly any Republicans take this view. The proportion thinking spending is too high is the highest since 1990 and one of the highest on record. Looking at the Republican side of the aisle, Jonathan Chait points out (via Matthew Yglesias), that even as scientific evidence on global warming has become overwhelming and most of the oil industry has ceased to promote delusional thinking on this issue, the same thinking has hardened within the Congressional Republican party, to the point where Republican members of Congress who are qualified scientists (amazingly, there are some) are barred from sitting on committees where they might disrupt the anti-science orthodoxy. The position of rightwing blogs is even worse, with a recent survey 59-0 score in favour of the delusional position. Looking at the evidence, Gary Kamiya asks whether this is just a swing of the pendulum, and in some respects it is, but some effects are likely to be longer-term. The general liberalisation of thinking on social issues is unlikely to be reversed. Moreover, while American faith in military power bounced back after Vietnam, I doubt that the same will be true after Iraq. If you wanted a textbook lesson in why resort to violence is rarely a sensible choice, Bush’s presentation of that lesson could hardly be bettered. I’ll end with one stat that ought to worry any Republicans who think sticking with the Rove strategy is a good idea. According to the Pew study, members of Gen Y (18-30) are about as likely to be atheists/agnostics (19 per cent) as Republicans (no age group breakdown, but it must be less than the 25 per cent for all voters given low party identification in this age group). Sorry, ecto accidentally posted the intro and graph. As someone-or-other says, read the whole thing. I’ll bet there are more atheists/agnostics, it is just a dangerous thing to admit to a pollster. the Pew Survey shows that Democrats and Independents are becoming pretty similar in the views to people elsewhere in the developed world (such as Europeans) – liberal on social issues, moderately social-democratic in social policy, preferring peace to war and so on. That’s all well and good, but there’s been a fundamental disconnect between what people say about “issues” to pollsters and the way they vote for as long as I’ve been following politics. If this kind of polling is to be believed, Americans “opposed” the bulk of Ronald Reagan’s policies even as they elected him twice. Yup. I’ve been disappointed too many times to allow myself to be optimistic- not yet, anyway. Because it seems as though we’ve been convinced that 26% of the registered voters, not even 26% of the American people, but 26% of the registered voters form a mandate – or a landslide. The GOP base has no problem – it need only construct a rural compound and withdraw to it for ecstatic worship of something or other. I’m not trying to diminish the denialism or parallel universe-ism of the right wing blogosphere, but the climate change thing uses a poorly worded question and the pollster didn’t ask, for example, John Cole. I seem to remember a similar pattern happening in the UK at the tail end of the Thatcher administration – but the conservatives still did well despite those polls until the rebranding of Labour. That might not be the case here, but its something to be aware of – its easy to imagine some group of people that will continue to vote Republican (especially in the very partisan environment of US politics), but would be embarassed to say so to a stranger (i.e. the pollster), and will instead claim to be independent or refuse to answer the poll. That’s what I find worrying. We have the birth of a viable ecosystem here, even as the pendulum is swinging back. It seems to indicate that the alternate reality that is building now will be there at the next swing, maybe expanded. As nothing really changed apart that, I’m not sure the long term drift to the right has stopped. According to the graph, in 2004 the Dems led 47 to 41, and yet the Bushies got elected easily. It’s not enough to hold these general views, they also have to cut thru the crap, layers and layers of it. Any source on that claim that Republican scientists are being kept off committees? 1. I’ll believe that US politics has changed if the Democrats can raise the gas tax 5c and not get nuked in the following Congressional elections. No sign of it yet. 2. As far as use of force etc is concerned, despite all this, the Democrats are still unwilling to even try to stop a possible US war with Iran. That’s not least because the parallel universe of news sources, thinktanks, blogs, pseudo-experts and so on which back up US Middle East policy in favour of Israeli settlers and (to a lesser degree for the Dems) oil companies are fully embedded in the Democratic party as well. The graph is either mislabeled or slightly wrong. Note that I am nitpicking here, not arguing that the general conclusions are incorrect. But look at the right side of the graph, for example. The 47s are not at the same level. The progression downward on the GOP side also doesn’t jibe with the numbers. Perhaps there was significant rounding or truncation going on? Or is this an artists interpretation of a proper graph? The reason I nitpick is because it’s silly to leave this kind of easy target out there for someone on the right to focus on to change the subject. Meanwhile, Republicans who do believe in global warming get shunted aside. Nicole Gaudiano of Gannett News Service recently reported that Representative Wayne Gilchrest asked to be on the Select Committee on Energy Independence and Global Warming. House Republican leader John Boehner of Ohio refused to allow it unless Gilchrest would say that humans have not contributed to global warming. The Maryland Republican refused and was denied a seat. Representatives Roscoe Bartlett (R-Md.) and Vernon Ehlers (R-Mich.), both research scientists, also were denied seats on the committee. Normally, relevant expertise would be considered an advantage. In this case, it was a disqualification; if the GOP allowed Republican researchers who accept the scientific consensus to sit on a global warming panel, it would kill the party’s strategy of making global warming seem to be the pet obsession of Democrats and Hollywood lefties. I wouldn’t use it to predict elections. With two parties, American politics will always tend to be close to 50-50. The policies of the parties go left and right as popular opinion and culture shifts around. However, the ‘true believers’ of 25% are more than 50% in GOP primaries, so until that coalition gets fractured (and boy will that be fun to watch) the GOP will have a hard time getting elected. Will American militarism recover after Iraq? Probably after another 20-30 years and a re-run of Desert Storm. You can look at the War of 1812 & Spanish-American war and see there’s no long-term trend to American militarism, it just cycles up and down. this is reminiscent of the behavior of some stars: they burn ever more brightly, only to explode sending off vast amounts of high energy vapor while the remnant collapses on itself and forms a black hole. The UK situation intrigues me: it seems that the voters aren’t terribly happy with Labour, but simply can’t take the Tories seriously. I wonder if the Dems could paint the Repubs into a similar corner? Surely, the Republicans are far more absurd than the Tories. But look at the right side of the graph, for example. The 47s are not at the same level. The progression downward on the GOP side also doesn’t jibe with the numbers. Perhaps there was significant rounding or truncation going on? Or is this an artists interpretation of a proper graph? My assumption is that the graph is drawn accurately, and the numbers are show rounded to 0dp, so one might have been 46.7 and the other 47.3 or something like that, hence not lining up. I call these people the 3rd Temple group or 3rd Templists. They no longer care about America, Americans, or even humanity. They have become obsessed with the Resurection/Rapture. The Bible says that the resurection will came after the Temple of Abraham is rebuilt (it’s been destroyed twice). The Temple is now “under” the Dome of the Mount and what remains of the second Temple is what’s known as the Wailing Wall. The Rapture cannot happen until the Dome is destroyed and the Temple is rebuilt. The fanatics of the Christian right thus became easy targets for a loosely coordinated team of corrupt red state politicians, greedy preachers, moony elites, rightwing Israelis, neo robber barrons (Abramoff, Mitch Wade, Blackwater, Halibuton) and Murdoch/Coulture/WaTimes type noise machinests. When you see/hear the noise machine and the pols (with a straight face) trot out some outragious talking point it is a litmus test for the 3rd Temple Group – it is required by the group to repeat and spread the lie/worldview/distortion. This is akin to taking communion for a Catholic. If you waver (from the peer pressure) then you are denying your faith. The shorter version is that the American left is holding back the destruction of the Arabs/Palistinians/Islamist/terrorist – whatever – whose pressence is holding back the destruction of the Dome which is holding back the rebuilding of the Temple which is when the rapture will come. The shortest version is that the American left is keeping Jesus from destroying the earth and taking his faithful to heaven. To understand this is to benefit from it in profit and power. You could write a book that attacked the American left as agents of the Devil (Hannity) and sell millions, or make a statement comparing the left to Nazis (Delay) and solidify your base, or, you could turn the USA into a bannana republic (Bush,Rove) and become the leaders of the worldwide plutarchist (new world order). If any 3rd Templist even begins to question it, he or she is denying their faith …. and going to hell. An interesting set of figures. But if the 25% living in a parallel universe all vote, they will determine the political system for the rest of us. It’s like oil refining: the lighter, sweeter, more useful fractions are being boiled off and collected, leaving a tarry, thick, stinking, toxic essence of wingnut at the bottom of the stack. They usually spread it on the roads. It’s actually 27%, not 25%. But that’s a minor quibble. The thing is, even if they were to assume permanent minority status, how healthy is it for America to have a significant minority (even if it’s only 27%) with a self-reinforcing belief system that is a) not just implacably hostile to the majority but hostile to democracy itself, and b) completely divorced from reality? I mean, sure, it would be better than having those people actually running things (which is so scary that I have to live in a certain amount of denial just to keep from giving up completely)…but still, as long as they control the party apparatus they could continue to do a fair amount of damage. Tom, indeed- there are many adjectives I might use to describe contemporary American political culture but “healthy” is certainly not one of them. I know a bunch of people who fit into the 27%- good people all, but they are (to use a phrase from my Catholic Sunday School boyhood) invincibly ignorant. I agree with ginger at 9. The climate change question as asked could easily be answered “No.” by someone who isn’t delusional. We don’t really know what proportion of the already experienced global warming trend is due to human intervention. The interval for climate sensitivity that represents the consensus (i.e. it’s somewhere between 1C-5C for a doubling of CO2) could accomodate a position where CO2 effects represent less than 50% of the current trend, such that human intervention is not the *primary* cause of current warming. Of course, it’s still *a* cause, and has the potential to become a primary cause of future warming if left unchecked, but the question isn’t all that clear about what’s to be considered. So answering no there might put you in at best a fringe position, but not necessarily a completely delusional one. They could have worded the question so as to paint the “nos” into a completely indefensible corner and still probably caught at least 90% of the right wing blogosphere. I am disappointed that they did not. What’s becoming really especially disturbing to me is not just how well-insulated that right-wing echo chamber is from outside contradiction, but how comprehensive its reach is. It’s hard to think of a significant public issue that doesn’t have a tightly-built, constantly patrolled orthodoxy at this point. But not on religion — that’s still the one thing that divides the USA from virtually every other industrialized country. We’ve got something like 80% expressing a belief in God, and something like 50% claiming to attend church regularly (versus something like 10% in Europe). And, of course, roughly two thirds don’t reject the theory of evolution. When it comes to God, American exceptionalism is still alive and well. But that could also be changing. One of the interesting things about the Pew poll was the steady rise in secular attitudes as age declines — culminating in that 19% level of atheism/agnosticism among the Gen Yers. Not Sweden, yet, but getting there. It’s also interesting that even though the GOP has aggressively branded itself as the “Party of God,” the voters are moving in the other direction, despite American religiosity. Combine the two trends, and it may be that like their spiritural brethren the Afrikaaners, Republicans (or at least, socially conservatives) are on their way to becoming a progressively more irrelevant minority — cornered, at last, by modernity. But if that’s true, the question is how they are going to react. They still control the military, after all. It could be that we’re witnessing a rise in BOTH atheism/agnosticism one on hand and evangelical and non-traditional Christianity (Pentacostalism) on the other. This comes at the expense of Anglican Christianity, Lutheranism and the like. But not on religion—that’s still the one thing that divides the USA from virtually every other industrialized country. Yes. It should be said, though, that virtually every other industrialized country is in Europe comprising only around 5% of the global population — meaning that in a global context it is Europe that is the outlier on the religious dimension rather than the USA. (I forget how Japan rates on that score). But it truly is encouraging if young Americans are secularising up. 27% cannot be characterized as “about 25%”? At the same time, religious-minded young Europeans may be more willing than ever to display their convictions in public. Perhaps the success of the Catholic Church’s World Youth Days and indications of rising religious practice among youth — as seen in a French TV report a few days back — are part of a trend. Also, don’t forget the role African immigration is playing in religious practice in Western Europe. The GOP held this conglomeration of differing interests groups together much the same way that Saddam held the “nation” of Iraq together. Mutual survival of these GOP-led groups depended on fierce loyalty, destruction of ANY opposition, and willful deceit & deception to keep this beast alive. Now, it is all coming unraveled and the GOP is spinning off into splinters and it’s every interest group for itself. Good Riddens. Some people have voiced concern that even though this 25% is a minority, it could be unhealthy to have such an ideological, misinformed group in American politics. The thing to remember here is that the right wing media bubble did not evolve out of nothing. It was consciously built by members of the Republican party and funded by their political success. If the Democrats hold Congress and the Presidency, that support will eventually leave the Republican party. So the question is, can this media bubble be self-sustaining? I think it can be financially at this point. But I’m not sure that it would be successfully self-policing. Once you cut off the head, I think there’s a good chance that things will slowly unravel. Another hopeful factoid (even though I try to resist too much optimism) is that the audience of Faux News, a key component of the media bubble, skews pretty old demographically (I can say that, being a sort of oldish fart myself. ;) ) Their audience is going to die off and not be replaced. @32 – the industrialized part of Europe may make up only 5% of the world’s population, but that’s about the same as the US. And Japan’s about half that size – I don’t know what religious affiliation is like in Japan, or even if that’s the right question to ask. If one may make projections, which group is the most fecund? The UK situation intrigues me: it seems that the voters aren’t terribly happy with Labour, but simply can’t take the Tories seriously. I wonder if the Dems could paint the Repubs into a similar corner? That’s funny, Anderson; I would say that this is pretty much the situation in the US…but it’s the Dems that no one takes seriously. It’s important to note how much of this ostensibly “right wing” noise machine isn’t really so much pro-anything as it is stridently anti-left. And this kneejerk anti-left impulse has definitely crossed over into the political “mainstream.” The very same “centrist” “moderate” voices who clucked and tsk’ed over Bill Clinton’s inexcusable, unforgivable sexual escapades are now clucking and tsk’ing over the fact that the Democrats now presume to hold the Republican president accountable for his actions. A highly mediatized, respected* figure like Andrew Sullivan can appear on TV and devote half his time to talking about what a horrible president George Bush is, and the other half talking about how Hillary Clinton’s “cooties” (verbatim). This is what we’re up against. Conventional wisdom dictates that while conservatives may do horrible things, liberals are simply horrible people. How you turn that around is the question. *Not by me, mind you–but somebody must respect him or he wouldn’t be on TV so much, right? I think that the main dynamic behind these observable shifts on poll numbers, is that the Republican Party of recent years sold out to frank revolutionaries of the far Right. For a long time, the underlying nature of what they have been about was masked by the genial dunces (Reagan, BushI, even pre-9/11 BushII) they used as front men and figureheads, but, in the arrogance of success following 9/11, they lost sight of the need to maintain a false front. I predict that the result will be a widening and deepening of the re-alignment that was started in the 2006 elections, but will end with no Republican office-holders left North of the Mason-Dixon line. This delayed reaction to the Southern Strategy may have happened anyway, but taken longer, without the failed Republican revolution. But what is also likely to happen, that might not have happened at all in the absence of the war in Iraq these radicals launched to seal their political dominance, is a significant roll-back of the national security state. They have succeeded in making support of this extreme position, by which this country spends more on the military than the rest of the world combined, no longer bipartisan, but have tied it to the party of a failed revolution. Well, perhaps we are premature in declaring the revolution a failure, since they could still resort to actual, guns-in-hand, revolution to rescue their political failure. The media phenomenon uncle kvetch describes is so omnipresent that the liberal blogger Atrios has an acronym for it- IOKIYAR (It’s OK If You’re A Republican). A certain amount of tongue-in-cheekness may have been lost in translation there. In any case, I threw in that (semi-snarky) line mostly in order to direct people to the brilliant, hilarious, and deadly accurate post by Kung Fu Monkey (which is actually on-topic, even if it gets to the topic by a different route). But what is also likely to happen, that might not have happened at all in the absence of the war in Iraq these radicals launched to seal their political dominance, is a significant roll-back of the national security state. That was supposed to happen after Vietnam, too. I’m not holding my breath. That makes no sense. Everybody knows John Cole is a raving leftist moonbat, why would ringwing news ask him? But it truly is encouraging if young Americans are secularizing up. Perhaps the Left would fair better if they did a better job showing religious folks how socially conservative policies often diverge from their reputed faiths (i.e, would Jesus have chosen lower taxes or feeding the poor??). Waiting for people to become atheists in order to promote social progress doesn’t seem like the way to go. If the Left did a better job of opening the eyes of the devout believers (who in theory believe in taking care of their neighbors) to the need for social justice, perhaps the Right would no longer be able to brainwash the religious masses in to believing that God is a Republican. I can’t share the optimism. Likud-like parties have dominated Israeli politics since Begin’s election in 1978. The right continues to dominate Israeli politics. One member of the ‘centrist’ cabinet calls for expulsion of the Palestinians, by compulsory ‘transfer’. This is Israelis of Arab descent, who have lived inside Israel since 1949. Bini Netanyahu, who was known to be corrupt as well as incompetent, is quite likely to be the next Prime Minister. The US will have more terrorist attacks on America and Americans. The US is very much isolated from its putative allies. Any study shows that threats of terror or death increase the conservative vote share. The US is on the point of war with Iran. You don’t think the American people will back their president in an attack on Iran? The US electoral college grants decisive place to states which are deeply conservative: Cincinnati is practically in the bible belt, and Ohio is no social liberal mecca. Let alone Florida, or Tennessee or West Virginia. Louisiana only tips Democrat, when it does, because of a massive black vote, which Katrina has now dispersed. More and more Americans live in exurbs, which are almost all deeply conservative. Just because a bunch of intellectuals on the 2 coasts have liberal social democrat values doesn’t mean flyover country does. Flyover country remains populist, but since when did isolationism and anti-immigration serve as mainstream liberal policies? I think the Republicans will continue to dominate American politics, at least at the presidential level. Starting with Rudi or McCain deep sixing Barak or Hilary. Yahh their guy is on his back legs. But with everything going for them, the Democrats only bared wrested control of the House, and the Senate is on a knife edge (who trusts Lieberman?). It’s doubtful the lunar confluence of events in 2006 will be soon repeated. Bush can be explained away, even by conservatives, as a bad mistake. Much the way liberals used to talk about Johnson and Carter. It doesn’t shake their core faith, they just had the wrong guy. It’s not a pleasant prospect for a European liberal, but there it is. The only thing we can hope for is a McCain, who takes global warming seriously, rather than any of the other candidates, who probably does not. Perhaps the Left would fair better if they did a better job showing religious folks how socially conservative policies often diverge from their reputed faiths (i.e, would Jesus have chosen lower taxes or feeding the poor??). There are a lot of Christians who would love to vote for the Democrats for precisely that reason. But it is never going to happen when that vote will also go towards putting pro-choice justices on the Supreme Court. What I find interesting is why secular people even care about morality. After all, there is no such thing as an objective moral value that is made of quantum fields. So if you believe in these invisible moral values, why not also believe in Santa Claus, and the Flying Spaghetti Monster? Cosmological arguments for the existence of God, even if they fall short of “proof,” are far more powerful than arguments for moral realism (moral realism would also contradict metaphysical naturalism). Alternately, you can fall back on the evolution of a moral sense. But that concedes the fact that morality is (a) subjective, and (b) merely a tool to enhance reproductive fitness. What’s your opinion of secular humanism and its ethics, Justin? As a Christian I’m not a fan of utilitarianism. But I actually like some of the ideas out of some secular humanists. For example, John Rawls’ Veil of Ignorance is a beautiful way to visualize the universal nature of ethics. And I like RM Hare’s logical work into the Golden Rule. I predict that the result will be a widening and deepening of the re-alignment that was started in the 2006 elections, but will end with no Republican office-holders left North of the Mason-Dixon line. Arthur Finkelstein — the Republican consultant who probably did more than anyone to make “liberal” (as in “embarrassingly liberal,” “ridiculously liberal,” etc.) into a political swear word — used to tell anyone who would listen that if the GOP became the Southern party, it was doomed. We may be about to put that to the test. I can’t share the optimism. Anyone looked at Israel? But the USA is not Israel or like Israel. National security paranoia is a spasmodic thing here, not a perpetual state of being. Hopefully, that time has now passed, although of course the possiblity of another major terrorist attack remains the ultimate wild card. I’m more worried about the conservative 25% becoming progressively more extreme and aggressive as it grows more isolated. We’re already pretty far down the road towards having an explicitly fascistic political mass movement in America. I’d hate to go any further. But note that the 6-point Democratic lead in 2004 did not yield a Democratic popular or electoral vote win in the 2004 election. I think America’s biggest problem is not the fact that these Republicans exist, it’s the fact that the other half* of america thinks they don’t. Liberals, democrats, and otherwise intelligent people of America are consistently refusing to consider the fact that their country is slowly being hijacked by almost the same kind of rejime that’s hijacked Iran or Pakistan. Even saying this kind of statement will freeze up almost any american I know into a weird self delusional patriotism claiming that America’s the best or some other thing. * And I do say half and half, because in my books, the elections trump all polls. Humans created God — not the other way around. If the God they created was a moral God, that’s because humans are capable of morality. One philosophical basis for a morality without reference to a God would be positing humans as the basic object for moral concern. Hence, humanism: in all you do, don’t hurt other humans. @32 – the industrialized part of Europe may make up only 5% of the world’s population, but that’s about the same as the US. That’s my point. The US is a single country, but its population is about the same size as the combined population of “every other industrialized country”, i.e. Europe (and Canada). So, among the industrialised countries you have 300 million religious Americans and 300 million secular Europeans. Which one is the outlier? Considering that the 90% other people in the world are closer to the US religious worldview, it just might be the Europeans. OK, throw in Japan, which is actually very secular (I checked) and it does indeed begin to appear like the US bucks a general correlation between GDP level and secularisation. Otherwise, I’d say that Canada is exhibit one for this — their relative secularity can’t be explained by any historic experience shared by and unique to Europeans. in the immediate aftermath of vietnam came the church committee, the rockefeller commission, the pike committee and the hughes-ryan act, all of which significantly rolled back the national security apparatus. so it’s not totally silly to hope for it to happen again. Well, duh, the election was stolen, just like in 2000. Seriously, people. If you count up all the shenanigans done to disenfranchise likely Democratic voters, and add the election machine wildcard, it’s pretty clear that’s what tipped the balance. Be careful about the triumphalism. This might be a blip, similar to the one that followed Watergate. That one brought the 1974 Congress in, and by a narrow margin brought us Jimmy Carter, then it vanished for a while. Right now there is a confluence of factors that is pushing against the Republican party. What happens when they go away? About Japan: really hard to make comparisons on religious vs. secular. I read a Japanese book on the perennial topic of “What makes a Japanese?” (always bestseller material in Japan) in which the author disputed the secularism of Japan. He said UNESCO or some other organization did the survey with the question, “are you religious?” and Japan scored very low. But he argued that the question in Japan should be, “Is your household religious?” which would give a very high score. Everybody is a member of a registered household, and most households are affiliated with a Buddhist temple or Shinto shrine or belongs to one of the new religions. And many corporations keep a Shinto shrine on the roof of their buildings and company attendance is mandatory at certain ceremonies. Is that religious or secular? Reminds me more of the Roman and Greek cults than modern religions. 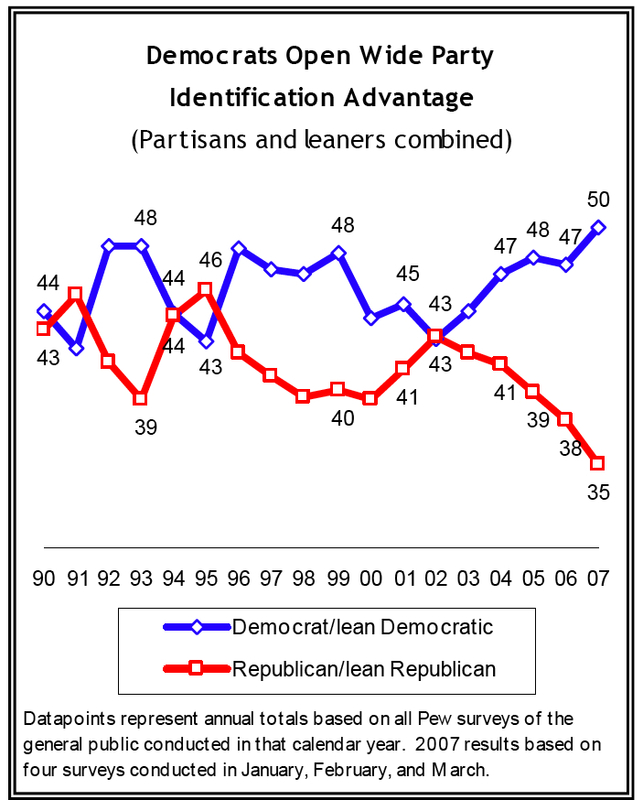 Democratic performance at polls has always lagged party identification. People who identify themselves as Democrats are more likely to cross over and vote Republican than vice-versa. Given that the 2000 and 2004 elections were close, this strongly suggests that the 2008 election will not be. If the Democrats draw the districts in 2010, which is entirely possible in many key states, the opposition could be looking at a long time in the desert. All of the trends are in place to make the party of Bush a regional party of the American South, with a handful of strongholds in the mountain west. We don’t really know what proportion of the already experienced global warming trend is due to human intervention. Who’s we? You don’t know because you are either an idiot or you haven’t done the math. It’s easy to figure out, 2 ppm/year and accelerating to 3 ppm/year. Goodbye holocene, hello paleocene. You’re nothing but FUD. The GOP was declared dead about 1974, then the Dems elected Jimmy Carter, and there was a resurrection. The ugly comments directed at conservatives and Christians just fuels the movement – keep it up liberals. And don’t forget the ability of the Democrats to self-destruct. The pendulum swings back and forth. The GOP will be down for a while but not for long. I wouldn’t be so skeptical if not for the fact that many conservatives show absolutely no sign they understand they have a problem — and to the extent they do, they seem to believe the solution is to make the GOP even MORE militantly conservative by purging the “RINOs”. Having lived through exactly the same phenomenon on the left in the late ’70s/early ’80s, I recognize the symptoms. But the conservative movement seems to me to be even more locked in ideological rigidity — resistance to change, after all, being one of the dictionary definitions of conservative. Good points. I was mainly posting to say … dude! We have the same name… Well, almost. I have an ‘S’ on the end. This name does not come up often. Cool. Even if it’s not exact. Maybe it’s just that both parties are pretty much the same, they serve pretty much the same group, same relatively small constituency. Their alternating and going up and down in the polls is little more than a mechanism to vent popular frustration. Certainly Democrats gaining power will make some difference to the oil and banking industries, but what’s in it for me? Probably not much. Alternately, you can fall back on the evolution of a moral sense. But that concedes the fact that morality is (a) subjective, and (b) merely a tool to enhance reproductive fitness. Justin, meet Is. Is, Justin. Now, say hi to Ought, Justin. This is something I have thought, too (but not said out so much!). Ideas of right and wrong which are true independent of anyone’s opinion of them, are as intangible and unprovable as anything can be, yet I don’t feel like a fool for believing in them. So why should I feel like a fool for believing in God? But this is a digression. I was going to point to an interesting, but very post-modern, variant of this argument which is made by Death in Hogfather by Terry Pratchett. When asked by he tries to protect the existence of the Hogfather (that is, Santa Claus), who only exists because people believe in him, Death says that they need to get kids to believe in the “little lies” such as the Hogfather, so that they later can accept the “big lies” such as truth and justice. Canada is British, and French. Britain and France are the two most secularised countries in the world, at least on some attitude surveys. What happened is Canada kept evolving in a European direction for much longer than the US, since it is a much newer country with greater ties to the old world (although Quebec was cut off, it radically secularised during the ‘Quiet Revolution’ of the 1960s– Quebecers now lead Canadians in secularism, having once been the most religious). Probably the same factors were at work in Australia and New Zealand (also highly secular countries). Note Europe has over 450 million people. I would call Poland and Romania industrialised? Poland has the largest steelworks in Europe. Let alone Slovakia! And Belarus and Ukraine for that matter, although they are not in the 450 million. Not sure where you get the idea that Europe has the same population as the USA? Just about every highly intelligent species has morality: chimpanzees, bonobos, gorillas, cetaceans like dolphins, whales and killer whales. It’s entirely possible that morality is innate to species. This might, or might not be an evolutionary advantage. You can show again and again in the lab that people ‘overvalue’ reciprocity and social consideration, more than the situation merits or is to their best evolutionary advantage. Conversely, you can review the citations for the Victoria Cross or the George Medal, and come to the same conclusion. The problem with religion-derived morality is that it, for example, allows muslims to kill non-believers, and Christians to kill Jews (and homosexuals). And virtually everyone to kill heretics! The core texts are contradictory and marked by unreliable witnesses (less so in the case of the Koran, of course). And then there is the old Protestant Old Testament v. Catholics and the New Testament fight. Protestants seem to think the OT is relevant, to the point of dictating morality. Protestants seem to think the OT is relevant, to the point of dictating morality. Most people who think like that may be protestants (I am not sure, though). But surely, such OT fundamentalists would only be a small subset of protestants — and largely American based. I guess I am stuck in an “old Europe” mindset as regards comparisons with the USA. It’s true that if you throw them all in the pot, Europe’s pop. is some 500 million. It’s not an order of magnitude different from the US though. There are some other reasons why the CE countries aren’t as relevant for comparison with the US as “old Europe”. Above all, their experience with a half-century of communism sets them apart in many ways. Also (partly for the same reason) they aren’t as economically developed as either “old Europe” or the US. Hence, including their secularity-to-GDP ratio as data points tends to blur the picture (lower middle income countries can be relatively secular, too) rather than enforcing the otherwise rather clear correlation b/t secularity and GDP level — which is the correlation from which the US deviates. You will find countries like Poland, Russia, Ukraine, Bulgaria and Slovakia in the lower left corner of that graph, suggesting as large a deviation from the trend as that of the US. Oh, and by the way, re: Canada. I find it genuinely interesting that Canada has a “European outlook” on this and many other socio-political dimensions. I don’t know enough about why, but like you I have to assume it has something to do with the factors you cite (British and French influence). I remain intrigued, though, since the USA would presumably exert a much more immediate and perennial influence. (Canada’s hockey teams even play in league with American ones!). All you have done is made a claim: don’t hurt other humans. But where is the scientific evidence to back up this claim? Precisely my point: there is no secular solution to the is-ought problem. Eskimos allow their elderly to die by starvation, whereas we believe that this is morally wrong. The Spartans of ancient Greece and the Dobu of New Guinea believe(d) that stealing is morally right, but we believe it is wrong. A tribe in East Africa once threw deformed infants to the hippopotamuses, but we abhor infanticide. Ruth Benedict describes a tribe in Melanesia that views cooperation and kindness as vices, whereas we see them as virtues. The evolution of a moral sense falls well short of being objective. Secondly, it is not binding. Why should I do what my moral sense tells me? My danger sense tells me that rock climbing and skiing are bad, but I do those and have fun. Thirdly, the strongest lesson you can draw from the moral sense is that it is a method for enhancing our reproductive fitness. But that falls well short of what we think of as morality. For example, the people in this thread are not saying: “Those Republicans are hurting their reproductive fitness by their immoral actions!” Instead the subtext is, “Republican behavior is objectively immoral.” There is a disconnect that an evolutionary moral sense cannot explain. And finally, what if I don’t want to maximize my reproductive fitnesS? There is no scientific evidence. It’s a choice. An axiom to live by. The point is, you don’t need to believe in a deity to choose it. You seem to think secularism/humanism has somehow put science in God’s place. But there is no contradiction between embracing scientific investigation and methods and recognising that there are important phenomena and questions in human and social life that are outside the realm of science. Moral questions is one notable such category. But that doesn’t mean you need to invoke a deity to be able to address them. And finally, what if I don’t want to maximize my reproductive fitnesS? Justin, I think you’re putting too much emphasis on this “reproductive fitness” thing. Even if evolution is indeed about reproductive fitness in some general sense, it most certainly isn’t about your personal reproductive fitness. (1) providing an objective principle. White slaveowners would claim that their ethics were entirely consistent with their ethical principles, as would eskimos who let their elders starve, or Republicans who do all that nasty Republican stuff. Why are the Republicans wrong if all we are doing is taking certain principles as axiomatic? They have simply taken a different principle. (2) What if they other guy – slaveowners, murderers, and child molester – also take your principle as axiomatic if they don’t want to? But there is no contradiction between embracing scientific investigation and methods and recognising that there are important phenomena and questions in human and social life that are outside the realm of science. Moral questions is one notable such category. But that doesn’t mean you need to invoke a deity to be able to address them. The question is whether you believe that morality is merely a product of evolution, or whether morality predates our existence but the process of evolution eventually produced creatures who were able to recognize moral laws. If moral laws are anything like the laws of logic (which there is quite a bit of disagreement on), then they were around well before we came along. For a Christian, this doesn’t cause a problem. For a robust physicalist, this does… but then again, so do abstract objects of any kind. The real question is to what degree will you honestly promote naturalism? Can there be immaterial things (like AOs, laws of logic, moral laws) that just are, and these things wouldn’t occupy space/time? I’ve grappled with this very question, and had a few talks with Harry about it. We both come from very different positions (I’m a Christian, he’s an atheist), but we both admit that either way it’s difficult to grasp moral authority. On a more positive note, I am living proof that if a lefty is respectful and not hostile to a religious believer, then they can come to see just how social justice fits in with their beliefs. I was once convinced that I must be a conservative merely because the Left was so anti everything I believed in… Then I met a respectful, honest, and friendly liberal who took the time to dialogue with me about it all… and now I think I’m a socialist. Change happens, but not with hostility. Start making some religious friends and see how quickly things can change. (1) White slaveowners would claim that their ethics were entirely consistent with their ethical principles, as would eskimos who let their elders starve, or Republicans who do all that nasty Republican stuff. Well, what is your solution? That they be stricken down by God’s lightning? Because if not, you will need some kind of human agency in order to enforce your belief system, even if it is self-consciously rooted in a supposition of a deity. There are many stripes of Republicans who are wrong in many different ways. But generally, Republicans (or people of any other political affiliation) don’t have to be wrong in any “objective”, or even “moral” sense for me to disagree with them. All that is needed is a different set of societal preferences. On tax, health care, the environment, etc. I don’t understand what you’re trying to say here. He is saying that you have no basis to claim that your system of ethics is better than system of ethics of a slave-owner or a cannibal. Which is fair enough, except that, yes – moral sense evolves. It was morally acceptable to own slaves 300 years ago, but not anymore. What’s the problem here? First of all, don’t be so quick to assume that God is a supposition. But lets table that issue for the time being and posit that God exists. Then owning slaves and not caring for the elderly are objectively wrong. God will forgive your sins (all you have to do is ask, and be sincere), but you are still violating a *the* objective ethical code. But we’re still facing the rub of your problem. You take one set of ethical principles as axiomatic. The Republicans take another set. Of course that leads to a disagreement. But why should Republicans (or independents) get rid of their existing ethical principles and adopt yours? Your view of ethics as adopting axioms is a lot like emotivism. “Gay marriage is morally good” translates to “Yah! Gay Marriage” and “gay marriage is morally bad” translates to “Yuck! Gay marriage!” Given this view of ethics, why should anyone change their ethical views anymore than changing their views of the merits of chocolate versus vanilla? Sorry, my mistake. Let me try again: given that ethics are simply the process of adopting ethical principles as axiomatic, why should anyone have any ethical views at all? Why not simply pursue their self-interest? I don’t think there is no necessary, logical correlation between Christianity and conservatism. Was Jesus a conservative? He threw the merchants out of the temple and denounced the bogus piety of the Pharisees. He preached non-violence and turning the other cheek. And he had the humanist doctrine at the core of his moral teachings: “Do unto others as you would have them do unto you”. Not: “Do as your God commands you to”, i.e. his morality relies on the human capacity for empathy. It is morally acceptable now to be a patriot loyal to a nation state – and 300 years from now it’ll look, perhaps, as creepy as a child molester today. given that ethics are simply the process of adopting ethical principles as axiomatic, why should anyone have any ethical views at all? Why not simply pursue their self-interest? given that prudence is simply the process of adopting principles concerning what constitutes one’s self-interest as axiomatic, why should anyone have any views about what is prudent for them at all? Why not simply pursue ethical behaviour? Jesus defies easy categorization. But “treat others as you would like to be treated” is not a humanist doctrine, although it has found its way into humanism. God is not just omniscient and omnipotent, he is also omnibenevolent. It is God’s nature to love us, and since we are created in God’s image, it is our nature to love others. Of course, the Golden Rule is a nearly uniform ethical principle that is held by almost all societies. As a Christian I would say that it is the law that God wrote on our hearts. An atheist would claim that we evolved a sense of empathy as a means to further social cooperation, and therefore to advance our reproductive success. It seems to me you have internalized a view of objective ethics. Society evolved to where our moral senses tell us slavery is wrong. Similarly you believe (and I happen to agree) that it will evolve to a point where patriotism is considered immoral. I’ll bet that if it evolved back the other way, you would reject the dictates of how society socializes the moral sense. In other words, there is a standard X. If society endorses X, then society is correct. But if society rejects X, then society is wrong. So now your mission, should you choose to accept it, is defend the existence of X. Well, why not? Seriously, all I can do is appeal to the inherent empathy in my fellow human beings. I think you are implicitly engaging in the very same endeavour in this conversation: You are pleading that there is no binding morality without God. But for that argument to convince me presupposes that I have a pre-existing sense of morality, and hence will see the need for a God. Hi stostosto, thank you, I’ve really enjoyed this discussion. Well, why not? Seriously, all I can do is appeal to the inherent empathy in my fellow human beings. That’s how I feel when I debate abortion! I think you are implicitly engaging in the very same endeavour in this conversation: You are pleading that there is no binding morality without God. But for that argument to convince me presupposes that I have a pre-existing sense of morality, and hence will see the need for a God. That is some truth to that, but I would put it differently. I submit that (1) deep down, you do not view morality as simply a principle to take as axiomatic, and (2) that if (1) is true, then this view of morality is not coherent with atheism (well, modern atheism, I suppose you could be a platonist). It is God’s nature to love us, and since we are created in God’s image, it is our nature to love others. Of course, the Golden Rule is a nearly uniform ethical principle that is held by almost all societies. As a Christian I would say that it is the law that God wrote on our hearts. Yes, but what about the slave owners? Didn’t he write on their hearts? And didn’t many of them read the Bible, go to church and think of themselves as good Christians? And rightly so — which demonstrates my point. How do you feel about the death penalty, btw? I am an atheist. I don’t know what you mean by “deep down”, and I am at a loss at how else I would view morality, deep down or not. You yourself have clearly chosen a particular set of axioms in your determination to follow some version of Christianity, and you (a bit curiously) seem to want to be very rational about it. There is only one person who truly lived up to the requirement of loving others as himself, and that was Jesus. The rest of us fall short. In the case of slaveowners, it was plainly obvious. For others you may have to peer deeply into the innermost recesses of our hearts. That includes both Christians and non-Christians equally. Society is not correct or incorrect; it’s real, it’s our environment where we, individuals, live and function. Suppose there is a nuclear war. Then in the post-war society morality will certainly be different: maybe abortion will become immoral again, maybe starving your parents will become acceptable. And it will be neither ‘correct’ nor ‘incorrect’. Justin, what you have created is a mystery solely if you are not an atheist. If you’re an atheist, there is no mystery. Atheists see that some atheists are moral, and some atheists are immoral. They see that some Christians are moral, and some are immoral. They see the same for Muslims, Buddhists, neo-pagans, etc. Clearly people have a capacity for morality that transcends any theory about morality. morality is derived from evolution. Non-religious morality is the uncodified form and not (necessarily) limited to your own religion. Same with altruism: It has been shown that altruism is (statistically at least) stronger when it supports your own family, clan, tribe, nation, humanity (in that order). More people die willingly for their nation than for humanity per se. People who claim to be pacifist will in a pinch fight to defend their family. Thus, altruism is also derived from (the same)evolutionary processes. People have waged wars for their religion in order to increase their group (e.g. enforced babtizing)or the influence of their group even if this was against their own religion’s strictures !! Religion may propagate but does not necessarily promote morality – just take a long and hard look at history. As Dawkins and others have noted, there is surely no way to be both omniscient and omnipotent. Correct, which is why I harped on evolution of the moral sense earlier in the thread. But that falls short of a morality that (1) objective, and (2) beyond self-interest. It does not explain why members of a majority ethnic group should not enslave members of a minority ethnic group. It does not explain why, say, Republicans should abandon what they consider to be moral in favor of what Democrats consider to be moral. It does explain why two equal societies should cooperate, but it does not explain why a strong society should not dominate the weaker society. It does not explain why Republicans should change their view on, say, abortion. That is another problem with using an evolutionary basis for morality: the division of those who are part of your tribe against the Other is codified into your basis for morality. The fact that you post to a website like Crooked Timber means that it is very important to you that other people adopt positions consistent with your ethics. But your secular worldview means that ethics are simply the process of arbitrarily adopting an axiom without any objective basis as to the validity of that axiom. Only to the extent that my axioms are: (1) there is an objective reality, (2) part of that objective reality is that God exists, and (3) there are objective ethical principles, which come from God. Now, I expect that you can improve on my characterization, but I would submit that your principles are like this: (1) there is an objective reality, (2) part of that objective reality is that God does not exist, and (3) therefore there are no objective ethics, and (4) but I will still live by certain principles just the same. ex ponto: That’s a new one to me. justin: I don’t believe that God helps you out with an objective moral standard here. What about God endorsing a moral standard gives it some absolute status, such that I must follow it? Surely you wouldn’t dispute that I can have my own moral code, you’d just say that mine isn’t real, or that it’s less real, or less objective. But I don’t see any fundamental difference in any random moral code, and the one endorsed by God. Even if I did believe in God (I’m an atheist) I could choose to ignore God and his morality. In fact, given how childish the Christian God seems to be, I’d probably strongly consider ignoring him. The idea that God provides a philosophically coherent basis for objective morality is just wrong. I disagree that you choose a set of axioms. Axioms choose you. You’re a product of your environment; your upbringing, education, material conditions and social interactions. And your own human nature, of course. Ethical values have a strong grounding in psychology. If you don’t live up to your own moral standards, you feel guilty about it. People don’t like feeling guilty. So they try to be moral. This response may concede ethical relativism, or at least intuitionism or emotivism, which is my position on it. justin: I don’t believe that God helps you out with an objective moral standard here. What about God endorsing a moral standard gives it some absolute status, such that I must follow it? Christian morality has two important traits to meet this standard. The first is that Christian morality is objective. God’s command to love our neighbor as ourselves applies to everyone no matter what his or her personal opinion. It applies to all societies, and it applies to all points in history. The second trait is that God keeps track of our sins and judges us accordingly. There is a moral accounting. Of course, God also forgives us of our sins (all you have to do is ask). But there is an objective account of the wrongs (or rights) that are committed. This does not deny our freedom to either follow or not follow the objective moral code. 104: Sure, it purports to be objective. And in a limited sense (its content), it is. But in that same limited sense, I can invent any arbitrary system of morality and say “it applies to all people in all nations equally”, and it would be objective in the same way. You’re claiming something stronger — that something about Christian morality gives it some philosophical precedence over other systems. But that’s just not the case. Unless, that is, you’re talking about the fear of hellfire. And if the fear of hellfire is supposed to be the prime difference (“My god’s moral priciples are backed by force!”) then I don’t think you’ve really made much progress. PDF, in that sense I compltely agree: Christian morality presupposes the existence of the Christian God, a premise that many readers of this blog would dispute! Christian morality presupposes nothing more than being put into your head (and the heads of many other people) at some point in your life. Probably when you were a kid. Had you been born Asian, you would’ve probably been a Buddhist now and thought that Christianity was the stupidest thing in the world. Fair enough, I don’t feel a great need to quibble with that. I think the position you are taking here is that you believe God’s existence is necessary for you (or anybody) to make living by certain principles meaningful. Your argument then boils down to a utilitarian view of God: If no God, then no morality. Which implies that you place morality in a position prior to God: Morality is a desirable good, there is no morality without God, ergo we must believe in God. God doesn’t just exist. He exists in order for you to make sense of your morality. But is that really faith in God, or is it not rather a fundamental craving for morality? Why make up something that doesn’t exist, and then live according to that something you just made up? Why, indeed? This is precisely what religion does. But I didn’t think religious people felt the need to rationalise it the way you do. And for good reason. It’s untenable. Had you been born Asian, you would’ve probably been a Buddhist now and thought that Christianity was the stupidest thing in the world. There might indeed by 70 million Christians in China, but there’s also ~1.3 billion Chinese who aren’t Christian. As for Spain, although immigration seems to have boosted religious observance somewhat, the trend seems to be downward. “According to a poll by the Social Foundation of the University of Francisco de Vitoria, 25% of immigrants lose their faith after moving to Spain. God will forgive your sins (all you have to do is ask, and be sincere), but you are still violating the objective ethical code. Huh? Which God? Whose ethical code? The conservative Catholic’s code, or the Liberation theologian’s code? The Southern Baptist’s code or the Unitarian’s code? The Calvinist’s or the Jehova’s Witness’s? The point is that everyone’s morality is subjective, in a certain sense. You don’t solve the problem by positing a God, because that act of positing is itself subjective. And the fact is that despite this inevitable subjectivity of morality, there’s a remarkable degree of agreement among human people’s as to basic morality. Murder, lying, gratuitous cruelty etc are considered wrong in just about every society, because the Golden Rule is sensible in any human society. Will We Suffer from the Iraq Syndrome? Diligence will be required to prevent another Reagan/Bush/Cheney clone from rising out of the heated swamps. I think I’ve read somewhere that, in fact, the Islamic brand is the fastest growing in the world. Provides better comfort and sense of solidarity, consumers prefer it. But so what. Tell you what. If Jastin was born in rural Southern India, in all likelihood he would not know anything about Christianity. He would’ve been raised as a Hindu – a billion strong oldest existent religion in the world. His moral code would’ve prohibited him from eating animals, especially beef. He would respect the cows as if they were human beings. He would’ve embraced the caste system. How ’bout that? What gives? Explain this to me – why haven’t Christian Father, Son and the Holly Spirit ever bothered giving these people the gift of the only true morality, allowing them to finally slaughter all those cows? Justin, back at # 89 you said “Society evolved to where our moral senses tell us slavery is wrong.” At that time society was highly religious, much more than now. All those slave holders were christians of one stripe or another, believing in the bible and God’s “Objective morality”. How come they “evolved” to change their views? Because they were forced to by humanists. Says a lot about your “objective morality” that it changed over time, mostly due to pressure from people who believed that morality could at least partly be founded in human experience. It is this humanism which has been the fountainhead of positive change in the world, while God’s “objective morality” has always been held up as the prime reason to oppose the changes which make the western world such a happy place today. You should bear that in mind before you argue to strongly for God’s ethics. There are a couple of responses. Although this discussion is about morality, that is not the totality of Christianity. God made Himself known to me and I became a Christian. Then I adopted Christian morality. Then, after reading about philosophy of religion, I become convinced by the arguments that there is no reasonable secular defense of religion. This is an invalid argument. The premises contradict each other. So you have to get rid of at least one of them. Most of the responses in this thread have been challenging (1). Some have challenged (2) by positing a cultural relativism. But you could also reject (3). How ‘bout that? What gives? Explain this to me – why haven’t Christian Father, Son and the Holly Spirit ever bothered giving these people the gift of the only true morality, allowing them to finally slaughter all those cows? That is the issue of Christian particularism (what happens to those who have never heard), and it is often held to be one of the most powerful objections to Christianity. However, I do not see it as being very powerful (although I do think there are some objections to Christainity that do have power). First, although I forget the Bible passages, there is some scriptural support that God will judge those who haven’t heard by the morality he has written on their heart. God wants as many people to hear the Gospel and become Christians as possible. One of the best ways is witnessing: people with Christian friends are more likely to become Christians than people who do not know any Christians. That is true at the societal level. The Christian west has become extremely affluent and successful (yes, Europe has secularized, but I’m speaking more broadly). That is a very powerful benefit for missionaries abroad. In fact, we can see that play out. Recall the Quiggon v. Cowen productivity debates. Those were economic debates, but if Europe ultimately has to abandon their ideals, then it would become a huge plus for spreading Christianity. But if the United States has to abandon its ideals, then it would be a huge plus for secularism. Needless to say, most people at Crooked Timber are betting on Europe. But either way, if we’re patient, we’ll have a definitive answer in another couple of generations. No, Justin, it’s the issue of your morality being no more “objective” than a Hindu’s or mine. Indeed one can reasonably argue that a (particular) secular morality is more objective than almost any religious one, because the premises are available to anybody, not just those to whom the Truth has been revealed. A Hindu cannot accept expliictly Christian morality without accepting Christ, but can in principle be persuaded of the virtues of say a consequentialist ethics without losing his or her faith. But I’m not trying to get into a “my morality is more objective than yours” argument, because the point is simply that every morality is invevitably subjective, but this isn’t the same thing as “cultural relativism”. Justin at 116, you said “Then I adopted Christian morality”. But you almost assuredly didn’t. You adopted a version of christian morality – the one that suits you. You almost certainly don’t have a morality which corresponds with the “objective morality” described in the bible, which is supposedly God’s word. This is the stunning stupidity of the modern christian attack on humanism. All christian morality has been strongly influenced by humanism, primarily in deciding which bits of the bible to “reinterpret” (i.e. piss off as barbaric or stupid), usually because our lived experience is radically divorced from the tomfoolery which mostly goes on in the bible. Unless you own slaves, stone people for working on sundays, refuse to eat shellfish, etc. blah blah – and this includes renouncing your worldly wealth, probably including the computer you are using to have this debate – you too have fallen prey to humanism, and to the view that morality is subject to our lived experience. So why bother claiming that a) there is a christian morality or b) that you adopted it? Or, for that matter, why bother to maintain that failure to maintain christian morality has any influence whatsoever on Europe’s future? The entire enlightenment, which was the time period in which Europes ascendancy was stamped on the world, was a period of modernising biblical morality to allow for our lived experience, as observed through science and the liberal arts. If Europe could survive that and become more powerful, what makes you think it will be affected by the last decline of spirituality now? Justin, you just don’t understand the atheist worldview (more realistically, worldviews, since atheism is just a convenient label for many different worldviews). Do you think you are making a new argument? You think we’ve never run into an eager theist who’s read C.S. Lewis or some other Christian philosopher? There’s no mystery here. There is only a mystery to you because you believe that God exists and is by definition the source of morality. As far as I can reasonably generalize, the atheist stance on morality is this: a) religion is false. b) people manage to be moral or immoral independently of their religious beliefs, therefore c) people have a capacity for moral thinking independent of religion. There is no general atheistic consensus of the source for this capacity. Abb1 for example thinks its purely socially constructed. I myself think its innate. Others (utilitarians, say) think it can be rationally derived from a few principles. I’m sure there are still other options that I’m not familiar with. If you are resting your argument that atheistic morality can’t be objective on the fact that moral standards have changed, then your argument proves too much. It proves that there is no objective morality, and that you agree with abb1. Your last comment is awfully Manichean. Europe could dump social democracy without adopting Christianity, and the US could adopt social democracy without losing Christianity. The historical record, if anything, points to the idea that capitalism is the enemy of religion. The most advanced capitalist parts of the US are the least religious. The parts that industrialized last are the most religious. The parts of Europe that industrialized last — Ireland, Spain, Greece — are the most religious. You can already see the impact of capitalism on undermining traditional religion in all three. Muslim leaders are keenly aware of this dynamic, which is why they have such stagnant economies. I have to admire your energy and perseverance, one man against many here. Not everybody would be up for that. But let’s agree not to open up yet another Pandora’s box of attempting to rationalise Christianity, this time via an economic productivity contest between Christian USA and secular Europe. That is silly on several levels, as I am sure you will agree if you give it just one more moment of thought. On a departing note, I can’t help observing again that you are inclined to a distinctly utilitarian view of God: God is useful! Not only because He gives meaning to our notions of morality – now He also confers prosperity on those who will believe in Him. And now, I am off for a typically European pastime: Vacationing in Spain. So long, and Godspeed to you. There’s no mystery here. There is only a mystery to you because you believe that God exists and is by definition the source of morality. As far as I can reasonably generalize, the atheist stance on morality is this: a) religion is false. b) people manage to be moral or immoral independently of their religious beliefs, therefore c) people have a capacity for moral thinking independent of religion. There is no general atheistic consensus of the source for this capacity. You are not fully grappling with the problem of atheistic morality. I have not argued that atheists cannot be moral. Indeed most of them are. Rather, I am claiming that objective ethical standards are not possible with the naturalistic worldview of the modern atheist. This means that atheistic ethics must collapse into either relativism, self-interest, or personal taste. Abb1 for example thinks its purely socially constructed. I myself think its innate. Others (utilitarians, say) think it can be rationally derived from a few principles. I’m sure there are still other options that I’m not familiar with. Abb1’s position is cultural relativism. It leads you powerless against, say, societies that sacrifice the elderly, commit infanticide, or (in one interpretation) criminalize abortion in order to oppress women. I’ve addressed the innate argument (the evolution of morality) in comments #78 and #99. Short answer: (1) It leads to divisions between those with whom you share genetic material and those that you do not, (2) empirically, it leads to relativism, and (3) it does not provide a reason why someone who is powerful should not pursue their self-interest through oppression rather than cooperation, and (4) it is a hypothetic imperative: if you want to maximize reproductive fitness, then act morally. But this means that people who do not want to maximize their reproductive fitness should be free to act immorally. Finally, no responsible utilitarian is claiming to have solved the is-ought problem. Utilitarianism logically requires that you accept certain axioms, not the least of which is that we shouldn’t act in our own self-interest! Have fun in Spain, stostosto! I enjoyed the discussion! And we (or some of us, anyway) have argued that objective ethical standards, in the sense of standing outside human society, are not possible with any worldview, because one’s worldview is necessarily subjective. The only thing that makes your morality “objective” is that you say it is. So does the person next to you who subscribes to a different brand of Christianity. And the person next to them. And so on for 6bn people. If there is a single capital-T true morality that is timeless, it’s not found in religion, for religious morality is as diverse and variable as secular morality. The only thing that makes your morality “objective” is that you say it is. Your objection begs the question. If Christianity is true (if the Christian God exists), then there is an objective morality. It doesn’t matter what forms of morality different societies, different people, or even different Christians adopt. If they disagree with God’s morality, then they are simply wrong. You’re surely aware, Justin, that many of the best-known signatories of the Declaration weren’t Christians but deists. What implications do you draw from this? I believe that includes Jeffeson himself. The first implication is that deism runs counter to the actual text of the declaration: an impersonal God would not endow all men with certain unalienable rights. But I confess to not being familiar with deist thought. Perhaps deists would claim that God set up a certain natural order, including that of an objective moral law, then took off. In any case, I was using the Declaration as a familiar example to demonstrate that God’s objective moral law can, and should, trump the laws of men. If they disagree with God’s morality, then they are simply wrong. Well, that’s begging the question, but I’ll set that aside for the moment. God could exist and be a psychopath. The point is that nobody can tell if they really are agreeing with God’s morality, because every Christian has a different conception of God’s morality and each believes their claim to divine revelation is valid. Even within denominations there is disagreement, and there are countless thousands of denominations. So your complaint that atheistic morality (which let me repeat is not monolithic) must because of its subjectivity “collapse” applies just as much to Christianity. The objectivity of your system of morality consists of arbitrarily choosing one brand of theism and declaring it to be capital T- true, in the face of billions of people who think their brand of theism or atheism is True or at least valid. And because your Truth is by definition based on divine revelation and faith, rather than premises accessible to all, it is hopelessly subjective. Now I don’t think that in itself is a problem, because objectivity isn’t the be-all and end-all of morality, but you clearly do. If it’s a problem for secular morality it’s far more of a problem for morality derived from an ineffable being’s will. God could exist and be a psychopath. Two points. First, that is why I’ve generally specified “If a Christian God exists.” If some other god existed, then Christian morality would not be objective. The point is that nobody can tell if they really are agreeing with God’s morality, because every Christian has a different conception of God’s morality and each believes their claim to divine revelation is valid. your Truth is by definition based on divine revelation and faith, rather than premises accessible to all, it is hopelessly subjective. Secondly, while Christians do disagree about how to interpret the Bible, that does not change the fact that there is a single objective moral law. For example, Christians have disagreed about the morality of abortion, but only one side is correct. Thirdly, you do not find Christians who disagree about, say, “Do not murder” or “do not steal” or “give money to the poor.” The vast majority of ethical principles are settled doctrine. Two points. First, that is why I’ve generally specified “If a Christian God exists. Yes, and I’m saying that the Christian God could well be a psychopath. That’s my interpretation of the Bible and it’s a large part of why I’m an atheist. But like I say, that’s a whole different question. But the whole point is that nobody knows for certain what that single law is, because anyone deriving moral authority from the will of a supernatural being is fumbling in the dark. All you have to go on is your own intuition, (an edition of) the Bible, and the collected exegesis of the last few millennia. None of which are remotely “objective”. If Bible-believing Christians disagree on whether abortion is or can be morally justified, how do you “objectively” decide who is right? And are people who wear clothes of two different materials or who eat pork or who “objectively” wrong? If not, why not? What good is it to “know” that one side must be objectively correct, if you can’t know what side that is? How is this situation superior to one which acknowledges the subjectivity of human morality, but makes the premises of moral argumentation available to all? If subjectivity is a deal-breaker for atheism, how can it not be for theism? You do not find many if any societies anywhere in the world who disagree about those things either. This is my point about subjectivity not being equivalent to moral relativism. Individuals in non-Christian societies will steal or murder or be miserly, but so do some Christians. We keep hearing that Americans are getting more and more liberal socially, yet Republicans keep winning and stealing elections, except when they botch things so badly that even their well-orchestrated propaganda machine can’t cover it up. Speaking of propaganda, that’s probably the Gang of Petrowhores’ greatest strength long-term: a simple message for a confusing world, even if that message is completely wrong and bears no resemblence to actual G.O.P. policy. And in a society where more and more boys are being raised without fathers, the Republicans’ reassuring father figure image and appeal to violence will never go out of style. Plus, there are a lot of guys out there who are pissed off because they can’t start a family, can’t even get laid, and can’t make enough money in a world where the gap between rich and poor continues to grow (although those dumb angry guys fail to connect this trend to Republican policies). Add religion to the mix and you’ve got the final ingredient for a core of die-hard supporters whose political influence will extend far beyond their numbers. In other words, be afraid. Be very afraid. So the Democrats are in touch with the rest of the world. Good for them. Sarkozy is ahead in the polls in France. Harper in Canada. Cameron in Britain. Merkel just won (narrowly) in Germany. And of the 3 top candidates in the US, only Obama is clearly against the US remaining in Iraq. As to polls on the environment. People overwhelmingly support the environment-on the way to buying their next SUV or minivan. But at least now some people can buy offsets. If anyone pays me $10000 I won’t buy that Escalade I can’t afford anyways. Anybody? I really liked your last post. It really helped to clarify my own thinking. the whole point is that nobody knows for certain what that single law is, because anyone deriving moral authority from the will of a supernatural being is fumbling in the dark. All you have to go on is your own intuition, (an edition of) the Bible, and the collected exegesis of the last few millennia. None of which are remotely “objective”. You are correct that no one knows for certain the full nature of God’s objective moral law. But we do know that it exists, and we do know that the answer is found in the Bible. And we do have enough of an understanding of that objective moral law to find broad areas of agreement. And where we disagree, we can apply ourselves to Biblical study to try to resolve our disagreements, secure in the knowledge that there is an objective answer. It is a lot like the famous Quiggon v. Cowen productivity debates. They both know their stuff, and they disagree about the future of social democracy. But the lesson is not that there is no objective truth on the issue. The lesson is that it can sometimes be difficult to know the truth. Oh, I forgot, thanks for the deist link. I’ll have to check it out. I am curious to see how a deist would reconcile natural law with an impersonal creator. Justin — your reply to Ginger Yellow’s post didn’t answer his(?) argument. You say that atheists are in trouble because they can’t measure their deeds or any of their ideas about morality against the objective standard of The True Morality. But that is the exact same position that you are in. Take the question of slavery. The Bible seems to condone it, but many Christians believe that it goes against God’s True Morality. Unfortunately, as you have conceded, nobody on earth can know the status of slavery in God’s True Morality. Therefore, you are unable to measure your moral belief about slavery against the Truth of the matter. So the mere existence of the Truth is entirely beside the point. Your argument is that atheists cannot have a genuine morality because they cannot measure their ideas or feelings about morality against an Objective Truth. But since you cannot measure your ideas and feelings about slavery against the Objective Truth of the matter — because you don’t know what that Objective Truth is — then that would mean that you cannot, under any circumstances, have any more purchase on the question of slavery than an atheist does. It would mean your morality — as regards this issue, at least, and thousands of others like it — is just as foundationless as the atheist’s.